Just reflecting on the response to the SOLO Flyer tweet below. DM messages have been pinging in from across the world. I started building an active community to support classroom based approaches to SOLO Taxonomy in New Zealand over ten years ago – spreading it to other places has been made a lot easier through blogging, wikis, YouTube, Slideshare (and now Issuu) and Twitter. Please could you send me a copy of the introductory flier? Have just come across this work and am intrigued. Very relevant to work we are doing in our schools on assessment at present. Would love a copy of the flyer. 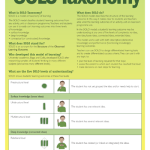 Trying to explain SOLO taxonomy to staff without getting over excited and making them confused… any suggestions? Hi iv just returned home from a CPD session on “show my homework” I’m interested in your solo flyer. I read your top ten tips and I am proud to say I do most if those. I do however only briefly mention homework at the start of the lesson and then give it out at the end. So I’m going to reverse that. Thank you. We’ve been introduced to this idea at school today and I’m really keen to find out more. Would I be able to have a flyer please? I have just taken on a new role within the Education Department and one of my tasks is to develop a Professional Network that builds the capacity of teachers and eventually drives edcuations change through the use of the SOLO Taxonomy. I have had some experience with it and have used it in the past in my own classroom in the past. I do have one of your books however as part of the intial set up of the network I would love to get a flyer and any other information that may support this vital network. Could you please email a copy of the introduction flier. Love SOLO! Please could you email a copy of the flyer to me? I am introducing SOLO taxonomy to the staff in September. I would really appreciate any help. A copy of this introductory flyer would be great, if I am not too late. Thanks! I am in the process of learning about SOLO taxonomy and how I can implement it into my teaching and learning programmes. Any resources or ideas would be greatly appreciated. I am really hoping that you can help me. I have recently been introduced to SOLO Taxonomy and am interested in doing some further research around how useful it is within primary schools for the “listening and talking” aspect of the literacy curriculum in primary schools. With your knowledge of SOLO are you aware of anyone who has used this framework specifically for this subject area? If so did they find it useful? Can it reliably used as a measure of change over a longer period? Could you put me in contact with anyone who has expedience in this area to discuss this further? I was recently briefly introduced to this by Ewen McIntosh at the NZLA Conference. Please could you send me a copy of the flyer. Could you please send me the flyer?! I am also interested in receiving the flyer. Thank you for providing the information on your site! Would it be possible to obtain a copy of the flyer to disseminate to my student teachers? I’m a teacher educator in the Netherlands, preparing a new set of workshops within our ITE curriculum, on differentiated instruction for student teachers. Since differentiation starts with developing a good sense of where pupils are, I would really like the student teachers to get acquainted with the SOLO approach to learning objectives and assessment. May I have a copy of the flyer. Thank you. Can I please have a copy of the flier, I am interested in finding out more and incorporating SOLO into my practice. Very interested to know more, could I get a copy of the flyer please. It would be great to get a copy of this, thanks. I would like to share this flyer with my pre-service teachers at Texas A&M University-Commerce. Would you be so kind to email me a copy? Could you please send a copy of the flyer please? Looks very useful. 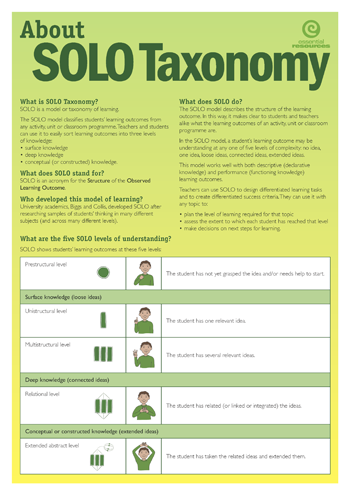 I’d love a copy of the flyer too please – I’ve just completed an online PD on SOLO Taxonomy and would like to introduce it to our learning community. Such an empowering tool for teachers and students. Many thanks, Julie. Please email a copy of the SOLO brohure. Can I please have a copy of your SOLO Flyer. I am interested in starting using SOLO in my school and want to get some information about it. Kia ora Pam, could I please have a copy of your brochure? I would love to try SOLO Taxonomy in my class. Thank you so much. I’d love a copy of this – we’re looking into possibly starting SOLO and I’d like to know more about it. I really like your leaflet about SOLO -= a great intro for teachers. Could I please have a copy emailed to me to share with some colleagues? I’d like a copy of your SOLO taxonomy flyer please. Could you please email me a copy of the Solo Flyer that you used for NZTweetchats. I am running a free workshop for HPE and Home Ec teachers and would like to share your flyer with them. Hi, this evening is the first time I have come across SOLO. Is there any chance you could e mail me the flyer please? I’m a visual learner and this looks great! Can I please have a copy of this flyer. I work with gifted students in Western Australia and am very interested in this as an approach to further enhance my students’ experience and skills in thinking and making their thinking visible. I’d love a copy of your flyer! Really getting a lot out of using SOLO with my Year 7 students. Please could you email me a copy of your flyer? Looking for ways to increase attainment of high ability students and looks worth a try. Please could you send me a copy of the flyer. I will be working across two schools next year and look forward to introducing it to both schools. Thankyou. Hi could I please have a copy of the SOLO flyer please. I have tried to fond it on the net but cant seem to find one I can print off. Hi, I would like to have a copy of the flyer in pdf. Thank you. I’d love a copy of your flyer! Really getting a lot out of working with SOLO. Please can you send me a copy of your flyer? I am just starting out in teaching and would love a copy of the SOLO flyer please! Am looking to use this in class this year, would love a flyer, and any other resources! Could I have a copy of the flyer please? We are introducing SOLO to staff in September. Thank you. I am starting a new position next year teaching Computational Thinking and I think SOLO is a perfect fit. Please could you share a copy of your flyer and any other resources you may have available. Thank you so much. Long time no see – I am back in a school – Principal of Golden Bay High School. I’m hoping to run a PL team on SOLO as a start to thinking about thinking but first need to let staff know what it is about to see if there is interest. Can I please have a copy of your flyer to print here? If the team runs I’ll of course buy books! Hi there. I’m attempting to reference the About SOLO Taxonomy flyer but I’m not clear on who the author is or the date it was created? Who is the publisher, Essential Resources? Thanks so much. Could I please be emailed a copy of the flyer. Thanks for sharing your resources. What a great way to check on students’ understanding! I was introduced to this taxonomy by a friend and colleague. I would love to have a copy of the flyer please. Hi there – our school is about to start exploring Solo. I would love a copy of the Solo Flyer for our teachers to help get them started. I am reading Visible Learning: Feedback by Hattie and Clarke and am very interested in learning more about SOLO. Can you send me the flyer? I am studying my Master in Primary Education and was introduced to your work by my lecturer. 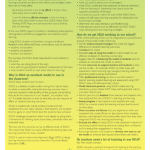 I would really like to get a copy of the flyer so I can model my classroom practice around it. I also think it would be helpful for my own children! I wish to learn more about SOLO taxonomy and also want to work on it. Will be grateful if I get flyer. 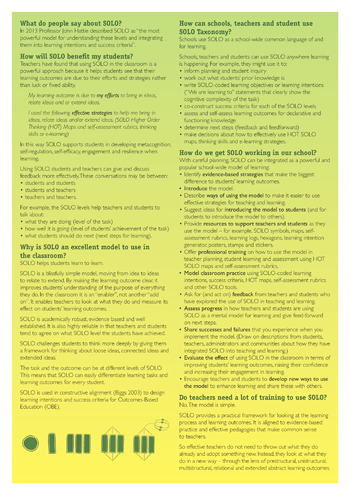 We have a number of new staff this year at Papatoetoe Central School and I would like to give them an overview of what SOLO is. Would you mind emailing me a copy of the flyer. Please email a copy of the SOLO flyer so I can share with my colleagues. Please can I have a copy of this flyer?